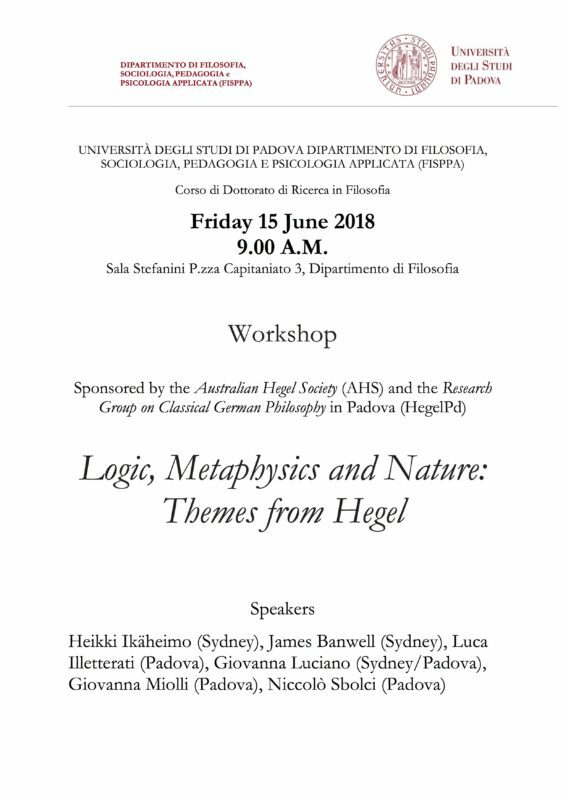 We are happy to announce that the workshop “Logic, Metaphysics and Nature: Themes from Hegel” will take place at the University of Padova on June 15th 2018. The event is jointly organised by the Research Group on Classical German Philosophy (hegelpd) and the Australian Hegel Society (AHS). You can find the flyer and the complete programme of the event below. 9.30: INTRODUCTION: L. Illetterati – H. Ikäheimo. 11.15: N. SBOLCI (Padova) From the philosophia naturalis to the Naturphilosophie. Some Remarks on the Notion of ‘Philosophy of Nature’ in Hegel’s Encyclopedia.